The first part of this article discussed the background and considerations for building a sturdy standalone container trellis. This part discusses the entire assembly of the garden trellis. The assembly of the container trellis will be two-step. The first step will be to modify the garden pot so that the trellis holders can be permanently affixed inside the container. The second step will be to assemble the bamboo trellis for the vine. The trellis structure can be attached or detached anytime from the container. 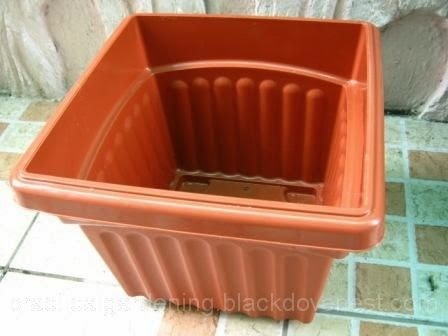 Plastic Garden Pot: Rectangular or Square - 1 pc. PVC Pipe: 5" long, 3/4" inside diameter - 4 pcs. These will become the trellis leg holders. Bamboo Strips: 6' long, 3/8" thick, 3/4" wide - 4 pcs. These will become the trellis legs. Bamboo Sticks: 15" long, 3/8' thick, 1/2" wide - 4 pcs. These will form the top assembly of the trellis. Steel Wire: G.I. wire gauge 18, 3 meters long - 1 pc. This will be used for tying up the bamboo pieces together. Will be used for fastening the trellis leg holders to the inside of the plastic garden pot. To finish the trellis and make it more durable. Measuring Tape - For measuring bamboo and pvc pieces to be cut. Pencil - For marking measured points. 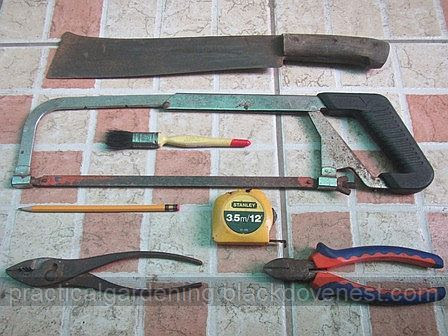 Hacksaw - For cutting bamboo as well as the pvc pipe. Machete or knife - To be used for splitting and trimming the bamboo strips. Wire Cutter - For cutting the G.I. wire. Pliers - For bending and forming the G.I. wire. Paintbrush - For painting the trellis. 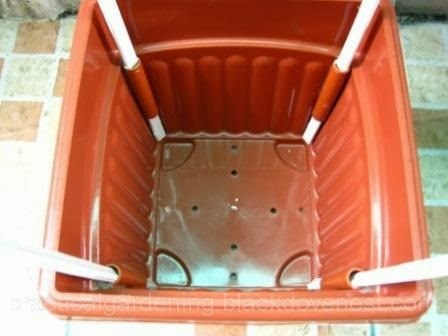 Get a suitable plastic garden pot that is rectangular or square in shape. Preferably, get one that has sharp inside corners. 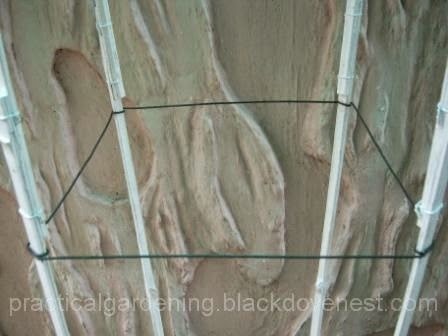 Inside corners that are a bit rounded may not adequately secure the affixed trellis leg holders. 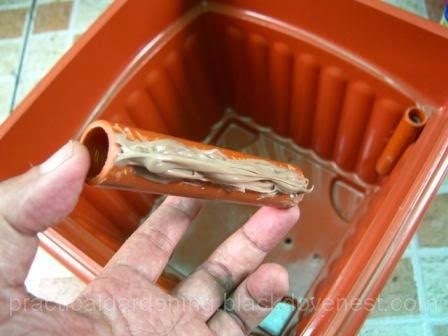 Shown below is the plastic garden pot that I used. It measures 10 inches high and 11 x 11 inches inside the top rim. 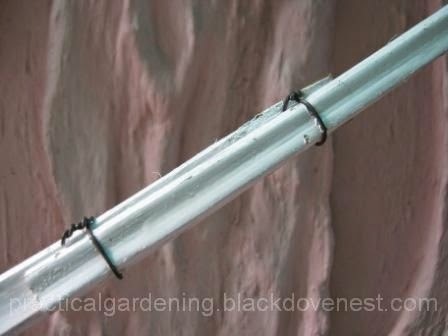 To properly secure the trellis leg holder, you need to create traction on the inside corners of the garden pot. The resulting rough surface will allow the adhesive or epoxy to properly adhere. With a sharp pointed object or knife, scour or make cuts along the insides of the 4 corners as shown below. Do the same for the trellis leg holders. 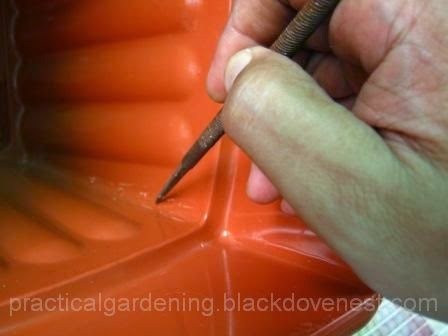 Create cuts only on the surface that will make contact with the inside corners of the garden pot. Shown below is one of the trellis leg holders that has been made rough with the cuts. Smear a liberal amount of construction adhesive on the rough surface of the trellis leg holder. 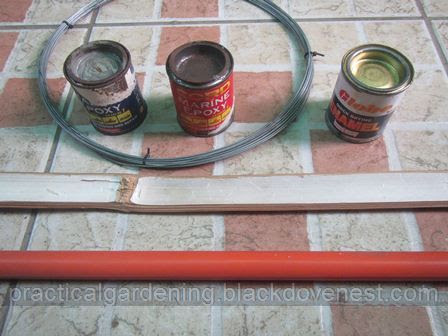 The adhesive should be enough to fill the gap between the trellis leg holder and the inside corner of the garden pot. Shown below is one of the trellis leg holder with adhesive. Inside the garden pot is one of the trellis leg holders that has been permanently glued to one of the corners. 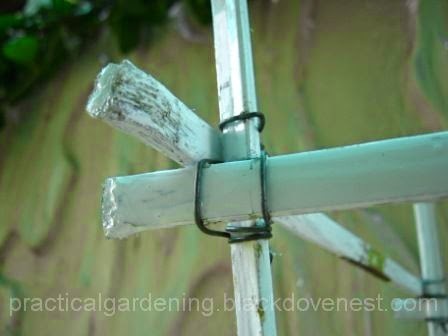 Ensure all trellis leg holders are properly glued and secured at the corners. Let the construction adhesive cure and dry completely. Prepare the bamboo strips by removing sharp edges with a machete or knife. My bamboo strips were only 4 feet long and so I joined two bamboo strips to make longer ones. I overlapped the ends together by 5 inches and then fastened them with steel wire. Be sure to bend the spliced wire joints along the inside of the overlapped ends to avoid cuts or injuries. Paint the bamboo strips with an oil-based quick-dry paint. Painting the bamboo will extend its life especially if it is exposed to the soil, the sun and rain. Here's a tip on how to paint on bamboo surface. Let the paint dry completely. 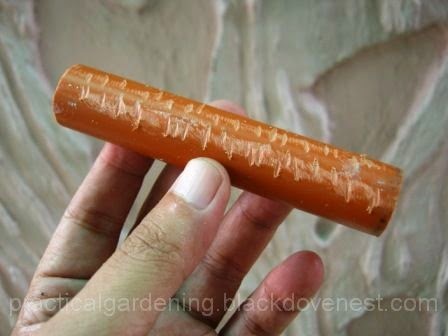 Insert all trellis legs (bamboo strips) into the trellis leg holders all the way down as shown below. The trellis legs should be snug while inside holders. Cut an appropriate length of the steel wire to join all 4 trellis legs together. Do this at the 24" and 48" marks above the garden pot's rim. Shown below is the steel wire joining all 4 legs. Note the wire wrapping on each trellis leg. Shown below is the wire joining the 4 trellis legs at the 48" height. Securing all 4 legs at this level makes it easier to add the rest of the trellis assembly. Note that the 4 trellis legs flare upwards so that the structure is wider at the top than at the bottom. This will allow the climbing vine's growing foliage at the top. For the topmost members of the trellis assembly, prepare 4 bamboo sticks. Lash them to the trellis legs with pieces of steel wire. Ensure the lashing is tight and bamboo sticks are secured. Paint all steel wire and bamboo sticks. 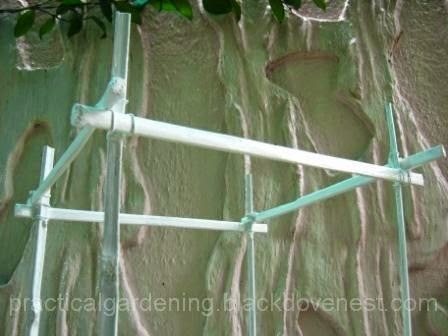 Here's the painted topmost part of the trellis assembly with the 4 bamboo sticks fastened to the trellis legs. Here's the finished product with newly planted vine. The garden pot and trellis structure cleverly hides a piece of concrete (catch basin cover) in the middle of the lawn. This is a simple DIY project where you only need basic tools and some scrap materials. Painting the garden trellis is optional but will definitely result in a more attractive and longer-lasting display that can be showcased anywhere in your garden. Eventually, the bottom ends of the bamboo trellis legs started to rot. This is due to their contact with the soil and water. 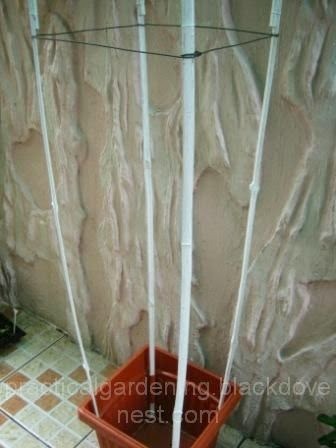 Here's how I reinforced and repaired the bamboo trellis in the garden container. 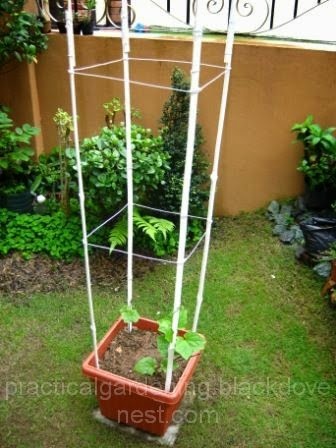 This is a good idea, making an attachment to hold the trellis instead of just staking it in. Yes, trellises, especially those that are this high, easily topple when just staked in.